Your septic system is a very fragile appliance. It is commonly referred to as the most expensive appliance in your home. If you have a septic system, long term maintenance is the key to getting the most life out of your system. Like every other appliance in your home, septic systems do not last forever; but with proper care and regular septic tank pumping, you can significantly extend the lifespan of your system. Your septic tank is where all your wastewater goes after you use the toilet or run the sink. Here, solids settle out of the wastewater. This leaves a clearer layer of wastewater “effluent” in the middle, which flows out to your drainfields. The solids that settle out in the tank remain here with the help of baffles until they are pumped out and removed. A baffle is a wall that blocks the solids from exiting the pipes leading to and from your septic tank. The baffles are very important! 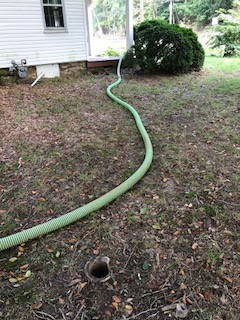 Without these, solids will flow out of your septic tank and into your drainfield where it will eventually clog it up, causing premature failure. Even if your baffles are in place, you still need to pump the septic tank to remove solids every so often. If you do not do this, there will be no free space left in the septic tank for solids to collect. Then, they will be forced into the drainfields with no other place to go. Now, let’s talk about solids. When the term “solids” is used in a septic tank, it is referring to solid human waste and toilet paper. It is not referring to common household items such as baby wipes, paper towels, hygiene products, food scraps, etc…the list goes on. These items, while technically “flushable”, can wreak havoc once they reach the septic tank. They bundle up, causing clogs and backups. Septic tanks are only meant to handle toilet paper and human waste ONLY. They are not designed to trap other objects, and these objects can clog pipes or take a toll on the drainfield if they end up in your system. Cleaning products and household chemicals are okay in small amounts every now and then because they become diluted in the septic tank and are not concentrated. Be mindful of what you are flushing down the toilet, and be sure to get your septic pumped periodically.